“Two 15 year old neutered males desperately needing a new home. There are two 15 year old Abys in very urgent need of a new home as their owner is getting remarried and his new partner is allergic to cats. The Abys are currently in a cattery awaiting their new home. One is blue and one is sorrel. One has IBS well controlled with diet, and the other arthritis. The cats are in Gloucestershire, but the owner is prepared to deliver them if necessary. Everyone knows kittens are cute. 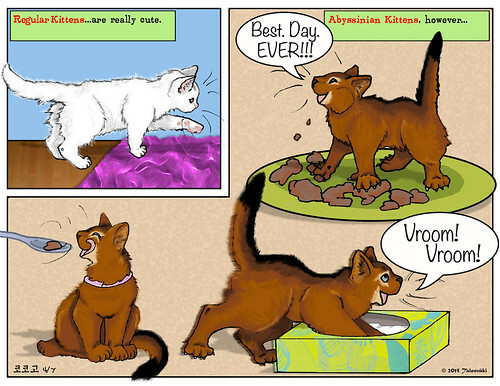 But Abyssinian kittens take it to a completely different level. This cartoon is inspired by Morag Richardson of Eskarina Abyssinians and her Esme’s most recent litter of three little Aby nutcases, Edith, Wilfred and Vera. The kittens’ full names are: Eskarina Wilfred Owen, Eskarina Edith Cavell and Eskarina Vera Brittain – they were named after a poet. a nurse and a writer from WWI. An interesting thing about these three: Wilfred and Edith were born on 18 February…and then, at 2am on 19 February, little Vera was born! My cartoon is based on this video…because even I couldn’t make up a kitten turning a tissue box into a go-cart! But really, the cartoon was inspired by Ann Cook McCall’s comment: “I can’t get over Edith chowing down. I came imagine her cheeks completely full saying, ‘Best day ever! '” So, of course I had to sketch that! And like Topsy, it just grew. Also, a funny thing about the tissue box Wilf is pushing: It’s Tesco Balm Mansized Tissue box! Check out this awesome “Adopt” T-shirt from Res-Q Threads! They don’t say it’s an Aby, but come on, look at those eyes! His name is Winston the Winter Cat…and if you buy his T-Shirt, $10 will go to the animal rescue of your choice (Which, interestingly, includes the Yolo County SPCA…the county I grew up in)! If you want a shirt with Winston on it, you’ll need to move quickly – he’s only available through 16 February! So hurry over to Res-Q Threads now before they run out of your size! Alsom, Abyfriend Sanna-Leena found these awesome cat cushions at Primark, but before you get all excited, Primark only has stores in Austria, Belgium, France, Germany, Ireland), Portugal, Spain, the Netherlands and the UK, and they don’t have an online store, so they can’t be ordered or shipped. But if you live in one of those countries or know someone who does, you’re in luck! Someone in Britain is surely missing this handsome man! And just look at that tail! That’s not Photoshopped! “He is around 12 – 18 months old, a neutered sorrel male, not microchipped and had no other means of identification. He turned up in a back garden around the middle of June, in Camberley, Surrey. We brought him into foster care at the beginning of July and have named him Lisso. We have had him vet checked, he is in excellent health and has been well cared for. He is very affectionate, definitely a “people” cat…He plays well with the cats in the foster home, except for another young male who he terrorises! As you can see from the photo he has a extremely long tail, which he seems unaware of, in that if he walks along a shelf, everything will be knocked to the floor by his tail! If anyone does recognise him, we would be extremely grateful for any information regarding his background and original home. 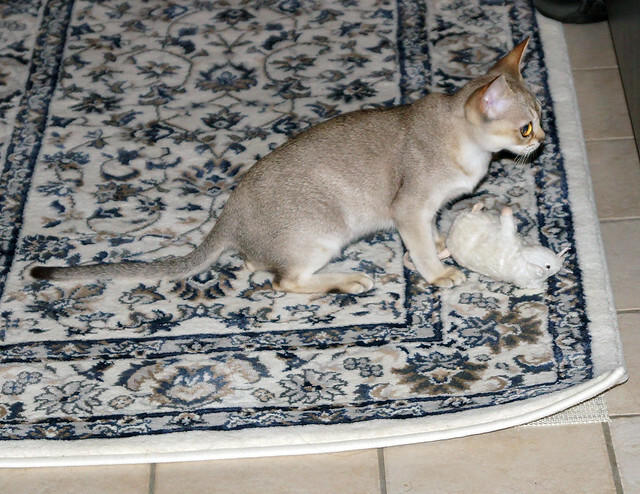 We will be rehoming him, but will be listing him with the Abyssinian Cat Club rather than using our normal methods. We are always careful with rehoming pedigrees, as they can fall into the wrong hands so easily,. If anyone needs to contact me, it would be better to use my personal mobile no 07785 724194. If you need any further info, please let me know. I know I have some readers in the UK, and every little bit helps. I think this boy just decided to have an adventure and went on walkabout, but his humans are probably besides themselves with worry. I’m not certain of the rescue he’s with, but I suspect he may be with Camberley & District Cats Protection; I don’t have an email, so if you think you know where he belongs, it’s probably best to phone the number above. I hope he finds his way home soon!